A new study of the environmental sustainability impacts of flying cars, formally known as electric vertical takeoff and landing aircraft, or VTOLs, finds that they wouldn’t be suitable for a short commute. However, VTOLs—which combine the convenience of vertical takeoff and landing like a helicopter with the efficient aerodynamic flight of an airplane—could play a niche role in sustainable mobility for longer trips. In the 1960s animated sitcom “The Jetsons,” George Jetson commutes to work in his family-size flying car, which miraculously transforms into a briefcase at the end of the trip. However, VTOLs—which combine the convenience of vertical takeoff and landing like a helicopter with the efficient aerodynamic flight of an airplane—could play a niche role in sustainable mobility for longer trips, according to the study, which published April 9 in Nature Communications. Several companies around the world are developing VTOL prototypes. 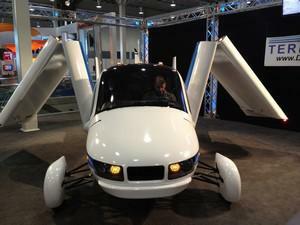 Flying cars would be especially valuable in congested cities, or in places where there are geographical constraints, as part of a ride-share taxi service, according to study authors from the University of Michigan’s Center for Sustainable Systems and from Ford Motor Company’s Research and Advanced Engineering team.